The Vollrath 9002NS Wear-Ever® full-size sheet pan has a non-stick coating that reduces cleaning and scrubbing needs. It is made of an aluminum alloy that resists dents and scratches. Because of the closed bead structure, rust-resistant, galvanized rods are built in to reinforce the edge. 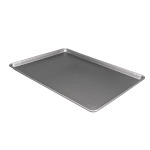 The Vollrath 9002NS sheet pan has a concave bottom that flattens when heated, evenly dispersing heat.